The vineyards for the 2003 Castello di Monastero Chianti Classico Riserva come from just south of Radda in Chianti, along the via della Malpensata near the Poggio Petroio. It is made with 85% sangiovese and a 15% blend of merlot and cabernet sauvignon, the proportions depending on the vintage. It is aged for one year in small French oak barrels. 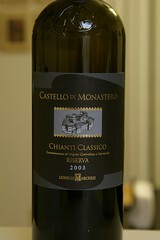 The wine is lush on the palate, with lots of ripe plum and toasty vanilla, full flavored and broad. This wine is great for spicy, grilled meat or just with a hunk of Parmigiano Reggiano.